More than 35,000 attendees and 1500-plus exhibitors gathered in Atlanta last week for FABTECH 2018. Characterized by a generally upbeat and optimistic vibe, technology solutions found throughout the three halls and 650,000-sq.-ft. of exhibit space, included the newly introduced LVD Strippit servo-electric E-1225 punch press, a real crowd pleaser. Thomas Weir, punching product applications specialist, explains why in this video. 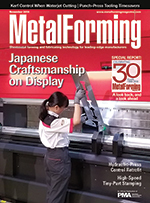 The February issue of MetalForming will include a FABTECH wrap-up describing the many innovations uncovered by our editors. The state of the automotive tooling industry looks sluggish for 2019, according to a study just released by Harbour Results, Inc. (HRI), a Southfield, MI-based advisory firm specializing in the manufacturing industry. The analysis predicts that 2019 spending on automotive tooling will fall to $8 billion, a 29-percent decline compared to 2017 and a 15-percent drop when compared to 2018 projections. IPG Photonics Corp., an Oxford, MA-based provider of fiber lasers and amplifiers, announced that it has signed a definitive agreement to acquire privately held Genesis Systems Group, a Davenport, IA-based provider of integrated robotic welding and automation solutions. Nordson EFD's MicroCoat® system uses LVLP (Low Volume, Low Pressure) technology to evenly coat stock while reducing oil usage up to 85%. This non-contact solution can be customized to any precision metal stamping application and is guaranteed to apply a consistent lubrication coverage while extending tool life. The Precision Metalforming Association (PMA), publisher of MetalForming and 3D Metal Printing magazines, has hired Damon Wolf as sales manager. In this role, Wolf will handle all print, online and other sales related to MetalForming and 3D Metal Printing in the Midwest territory, and also assist in managing activity in other sales territories. He will work closely with Brad Kuvin, publisher/editorial director of these publications, to help develop new products and drive revenue. The Precision Metalforming Association presents METALFORM EDU, a comprehensive online training system specifically designed for the metalforming industry. METALFORM EDU includes more than 550 skills-based courses, including 35 metalforming-specific courses NOT offered anywhere else! Learn how METALFORM EDU is the flexible, convenient and cost-effective training resource your company needs. 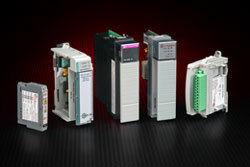 Helm Instrument is a licensed technology partner with Rockwell Automation and manufactures strain gage input modules for Allen Bradley PLC s. Each module has two independent channels of tonnage monitoring and high- low alarm setpoints. These modules reside on the backplane for seamless integration with the tonnage and setup information displayed on your operator interface. February 12-13, Lubrication Technology for Metalformers, Hyatt Regency, Schaumburg (Chicago), IL. This conference, powered by MetalForming magazine with support from the Society of Tribologists and Lubrication Engineers (STLE), will update stampers and die shops on new lubricants for stamping and tool and die machining, and help them evaluate new formulations and select the right lubricant for the job. Attendees also will come away with an understanding of the various techniques available for applying lubricant, to ensure optimum application while minimizing waste. Kick off 2019 with a must-attend, info-packed event, the Metal Stamping and Tool & Die Conference, January 29-30 at the Nashville (TN) Airport Marriott. Presented by the Precision Metalforming Association in association with MetalForming magazine, the conference features keynote presentations, educational breakout sessions for stamping and tool and die, exhibits and a networking reception for more than 200 attendees and sponsors. Track sessions feature new, emerging, evolving and maturing technologies and industry trends that are impactful to metal stamping, die design and die construction companies. MetalForming found both in abundance during a recent Amada-sponsored tour. This maker of electrical and electronic components for automotive and more has specific manufacturing needs, handily addressed by its high-speed machine. See also: Nordson EFD, LLC, Helm Instrument Co., Inc.